'Auditing' is the term we use for spectators at clinics, and this is one of the easiest, cheapest and most beneficial ways to see what the Parelli Program is all about and make huge progress in your horsemanship. 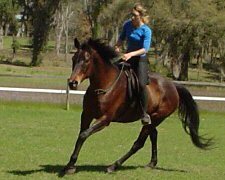 Fawn says, "The first time I attended a Parelli Clinic in Australia in '97 I was literally blown away by how much I took away from that clinic. I had never learned that much participating in a clinic! Let alone just watching it. After that first experience, I made sure that I was at every clinic in a five hour radius of me, whether it was for my Level, the one above or the one below what I was currently studying. I found that the lower level clinics really cleaned up my understanding of the basics (which helped me with my foundation) and the higher level clinics showed me where everything was leading and helped to put a purpose behind some of the tasks that I was currently working on. As a result I was able to pass both my Level 1 and 2 in well under a year! And I had loads of exercises to work on once I got back home to Canada and started through the levels again with my own horses." Every Instructor has a very unique teaching style and different exercises to teach the same concepts. Auditing a clinic is a very good way to see your potential Instructors 'resume' in action! Does she clearly explain the exercises so that you understand what to do? Does she explain why you are doing it and what you are hoping to achieve by it? Do you like her teaching style and would you feel comfortable with her as your horsemanship coach? There are often opportunities to audit a clinic for free in exchange for being a volunteer and helping the Clinic Coordinator with equipment sales, lunch, check-in or advertising prior to the event. If you'd like to volunteer, contact the coordinator for more information on signing up! Although the Parelli Natural Horse.Man.Ship Program is designed to function as a home study program, there are many instances when you have questions that aren’t answered in the pages of the booklets. Attending a course with a Licensed Instructor can give you a boost, be it through reassurance, confidence in your techniques or overcoming any issues – they are here to help you! Workshops are a great way for students who are working on the same subject to get together with Fawn for task specific coaching. Problem Solving clinics can cover anything from trailer loading, jumping, leads, impulsion, horses that don't like needles or flyspray....the list is endless. Clinics are a great way to measure progress and fastrack your levels journey. You also get the chance to meet other students in your area, many of whom form study groups to support each other as you're learning. Fawn runs courses throughout the year in British Columbia, Ontario, across Canada and abroad. If you would like to know more about the clinics Fawn offers, see 'What to Expect' or 'Calendar'. Clinics are usually run for two or three days and you bring your own horse to them. They are run in a variety of locations and are most often organized by a local host or clinic coordinator. Most people travel quite far to come to a clinic so they stable their horse at the venue and either camp or stay in a local Bed and Breakfast. Clinics are designed to give you the principles and concepts that you will need for your level. Please do not bring stallions or unstarted horses. To get the most out of your clinic experience bring the most dependable horse you have. We would also suggest that you get the Level kit (information & equipment) before you come to the clinic. By no means is it a prerequisite to have these things, but if you’ve had a chance to go over some of the theory and get comfortable and co-ordinated with the equipment you will get much more out of the clinic. Clinics usually start at 9am and begin with an introduction and theory session without horses. This gives you the chance to meet everyone else in the class and to talk to Fawn about your horse and what objectives you have while in the clinic. It also gives you a chance to soak up some of the theory in a relaxed friendly environment before trying it out with your horse. The next part of the clinic is dependant on the level of the class but will begin online. Lower levels will be taught online until lunch. Higher levels may ride. Lunch is at approx 12noon and lasts for an hour and a half. The afternoon session will again depend on the level of the clinic but for level two and above it usually involves riding. The course will finish for the day at approx 4:30pm. The evening is your own, however there is usually something going on to get involved in if you ask. At some clinics, Fawn joins the students for a meal or B.B.Q or does a short inspirational demonstration with one of her horses. At others the students get together themselves for a drink or dinner etc... The main thing about clinics is that they are fun and are a great way to meet other Savvy minded people!! Days 2 and 3 also run from 9am until 4:30pm and will begin with a theory session and often a practical session without horses, where (you guessed it), you get to be the horse!! These simulations seem silly to begin with but as anyone who has tried them will tell you, they are very eye opening and a great learning tool. They completely change the way you think about your horse and how you ride and treat them. The exercises you then do with you horse for the rest of the clinic will again depend on the level you are at and the students and horses that are in the class. As a general idea, here is a list of things you are likely to learn below. Learning how horses think and why they act like they do. Learning the seven games on the 12ft line. Teaching your horse not to be afraid of you or your equipment. Teaching your horse to yield from pressure. Leading and saddling safely and calmly. 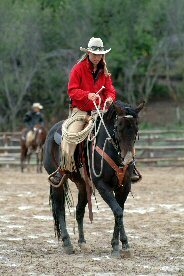 Learning how to ride with one rein; this includes lateral flexion, stopping, backing up and being able to control your horses hind quarters and front quarters independantly. Playing the seven games at a higher level and on a longer (22ft) line. Liberty (This means playing with your horse without any rope) inside and outside of a round coral. Riding in the halter, the cherokee bridle and the bridle. Drop to trot lead changes. Playing on the 45ft Line. Riding in a Savvy string. Instructors have both Clinic Coordinators and Hosts. Coordinators are the people who regularly organize, schedule and run clinics for the Instructor. Some Instructors have one Coordinator to handle all of their bookings and others have various coordinators for different areas. Coordinators are usually compensated for their efforts by receiving 100% of the auditor proceeds as well as a complimentary rider spot if the clinic is filled. The host is the local contact person (sometimes also the coordinator) and is responsible for all the on-the-day tasks associated with running a clinic. They are either given a free spot in the clinic to ride or are compensated for the use of their facility. If you are interested in coordinating or hosting a clinic anywhere in Canada, you should contact Fawn Anderson directly for more information and read the section called Hosting a clinic or lesson. Bookings for 2012 will begin to be taken in October of 2011.